Solihull, UK – Tarmac has enhanced its rail freight capabilities with a series of new innovations as part of an ongoing commitment to productivity and supporting delivery of the UK’s infrastructure ambitions. The UK building materials and construction solutions business has become the first in the UK to install a Liebherr LH80C ‘Supergrab’ Gantry Materials Handler. 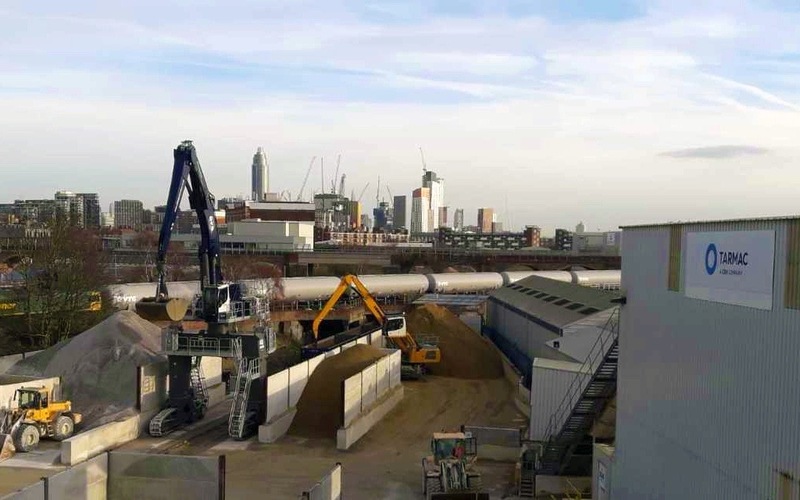 Recently unveiled at its Battersea concrete plant in London, the new equipment from Rail Freight Services will significantly boost site performance by enabling faster offloading, improved stock control and increased delivery capacity. In a European-first partnership with Ermewa, Tarmac has also installed GPS tracker systems on its freight wagons, giving real-time visibility of their position on the network and allowing customers to know precisely where a train is and when it will arrive for offloading. Chris Swan, head of rail at Tarmac, said: “Developing our rail freight capability and capacity is key to our operations and aligns with the national agenda to deliver a low-carbon built environment. We’re continually exploring and embracing innovations which support our efficient delivery of the right materials to the right place for customers. Tarmac is also working with leading international wagon hire and rail logistics company VTG to trial a new system designed to enhance the company’s rail freight maintenance programme. The ‘VTG Connect’ units have been fitted to freight wagons and provide live visibility of the company’s trains to maintenance crews and help reduce overall train downtime. In addition, the company continues to enhance its fleet of modern, efficient wagons to support freight expansion and the latest set of box wagons from Freightliner are now operating from Tarmac’s Tunstead site. Tarmac is one of the UK’s largest users of rail freight and currently transports more than nine million tonnes of construction materials by rail across the UK each year, helping to cut carbon from road vehicle movements.